Greg Thompson, 54, of Waldo tosses ice off the top of unpackaged mussels at Pemaquid Mussel Farms, a new mussel growing and processing center in Bucksport. 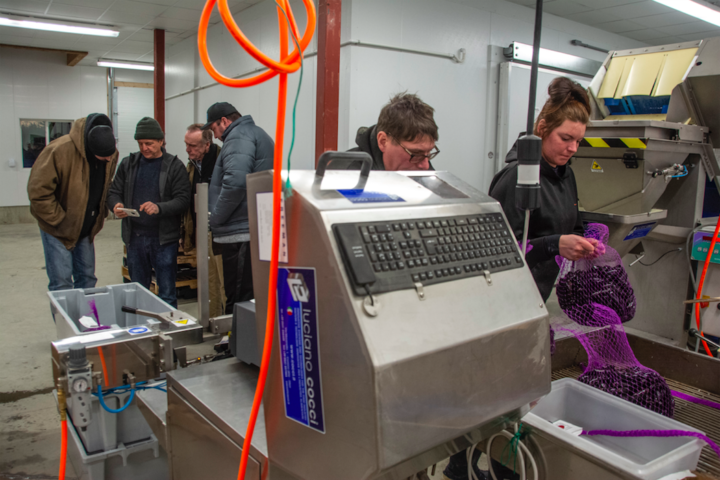 BUCKSPORT, Maine – A new seafood bagging plant is open in the town’s industrial park, and the company that runs it is looking to assert itself in Maine’s growing mussel-farming market. 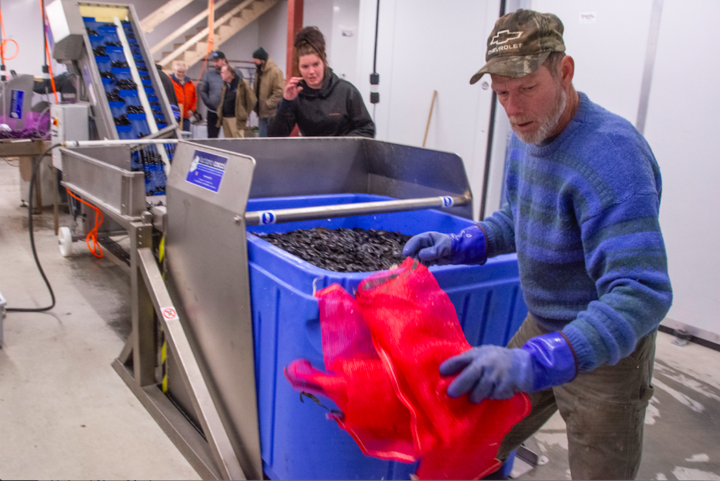 Pemaquid Mussel Farms opened its mussel-bagging operation at Buckstown Heritage Park in mid-December, said Carter Newell, founder and managing member of the mussel farm’s limited liability corporation, which is based in Damariscotta. Newell’s business grows hundreds of thousands of pounds of mussels at any one time on a dozen rafts in 100 feet of water about three miles off the coast, then brings them to Bucksport for bagging and cold storage. His goal: To build a crop of 1 million pounds of mussels annually and capture part of what he and industry observers call a growing and lucrative market in farmed mussels. So far, four people are working at the mussel-bagging operation, Newell said. Canadian mussels grown off Prince Edward Island currently have a larger market share in the U.S. than Maine-produced mussels. In 2015, Canadian producers sold 25.9 million pounds of mussels in the U.S., compared with 14.4 million sold by Maine producers, according to a 65-page study co-authored by the Gulf of Maine Research Institute in Portland. Pemaquid Mussel Farms, a new mussel growing and processing center in Bucksport, can process hundreds of pounds of the sea creatures at a time. 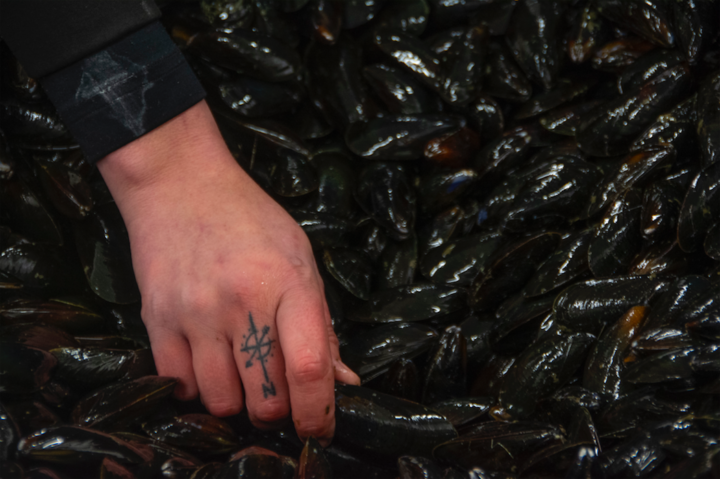 The Canadian market for mussels in the U.S. is expected to grow, reaching 30.6 million pounds by 2030, said Chris Vonderweidt, the institute’s aquaculture program manager. But that represents an opportunity for Maine mussel growers because consumers generally perceive the mussels from Prince Edward Island to be of lesser quality, Vonderweidt said. Of the 14.4 million pounds of mussels produced in Maine in 2015, only 1.35 million came from farms like Newell’s, so Newell and other mussel farmers have the potential to grow themselves into the seafood market, Vonderweidt said. Greg Thompson, 54, of Waldo takes ice off the top of unpackaged mussels at Pemaquid Mussel Farms, a new mussel growing and processing center in Bucksport. “There is no question that whatever Carter is growing, he is going to be able to sell it,” Vonderweidt said. Newell’s is among four seafood plants at the industrial park, and it is among the reasons why town officials hope Bucksport will become as known for seafood production as it was for the production of paper before the 570-employee Verso Paper mill shut down in 2014, said Richard Rotella, the town’s economic and community development director. Bucksport also has an indoor salmon farm due to start construction at the former Verso Paper mill site this year. For his part, the 63-year-old Newell is cautiously optimistic. Pemaquid’s new two-story building and accompanying equipment – including a bagging machine, room-sized walk-in freezer and ice-making machine – represent a third of his total $1.5 million investment, he said. The operation seems pretty simple. Pemaquid mussels are grown on the offshore rafts, which Newell designed. They are collected on the Mumbles, a specially-designed harvesting and processing barge, before shipment to Pemaquid. Carter Newell, founder of Pemaquid Mussel Farms [with cellphone], talks to potential investors in his new mussel growing and processing center in Bucksport, while Danielle Ames and Tim Levesque package the seafood. The work makes for long days. Newell and a handful of crew members spent most of Tuesday farming mussels offshore, loading them into half-ton insulated containers, and taking the mussels to Bucksport in the backs of pickup trucks. 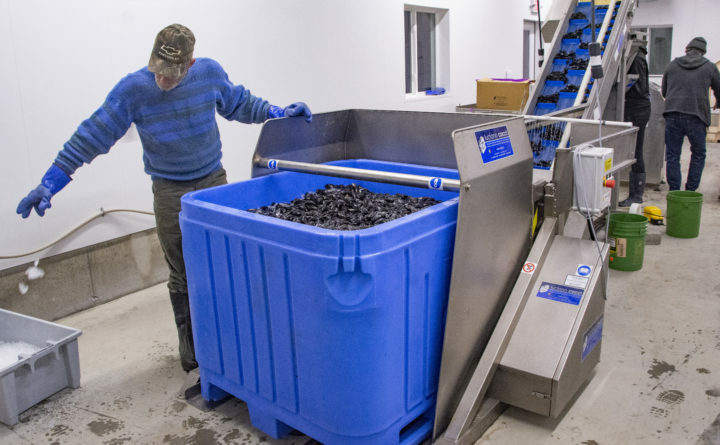 The mussels arrived at the plant at about 4:30 p.m., and for several more hours, the crew bagged mussels as they rolled through a conveyor-belt system that washed and portioned them. This is a slow time of year for the business, said Peter Fischer, a Pemaquid worker who shoveled ice atop the bagged mussels as other plant workers gently laid them into a waist-high cardboard box. “Summer is the busy time,” Fischer said. Pemaquid had visitors on Tuesday from American Mussel Harvesters, a North Kingston, Rhode Island-based firm and a potential investor in Newell’s business. One of the company’s owners, Bill Silkes, said he has known Newell for years and was impressed with his plans. “His business has grown a lot since we last took a look at it, about five years ago,” Silkes said. 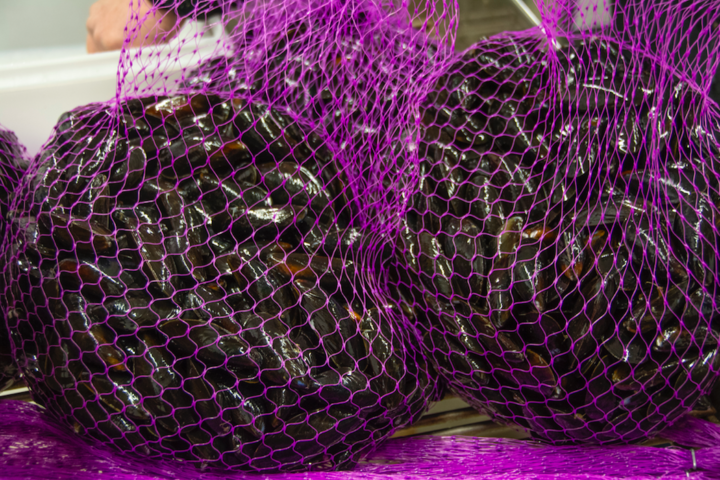 These packaged mussels at Pemaquid Mussel Farms, a new mussel growing and processing center in Bucksport, are intended for restaurants and other wholesalers. The new plant will eventually stuff about 1,000 10-pound bags with mussels each day for cold storage or distribution to restaurants as far south as Boston, said Newell, who has a bachelor’s degree in biology from Colby College, a master’s degree in oceanography from the University of Maine and a Ph.D. in marine biology from the University of New Brunswick. Newell said his work represents the commercialization of about $500,000 in research grants — about 90 percent from the federal government — over the past five years.